The 21st century soldier bears a heavy burden, literally. With 100 to 150 pounds of weaponry, tactical gear, communication devices, and military rations—and that’s just for starters—army personnel also have to lug along hefty battery packs to keep their gadgets juiced. 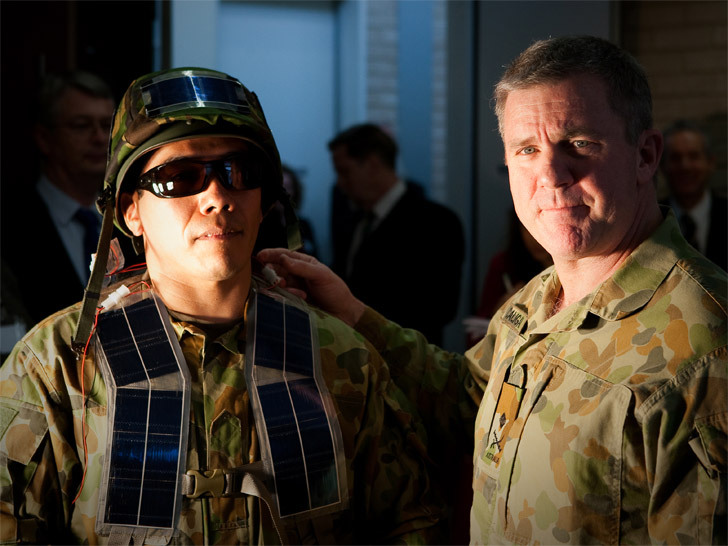 To help lighten the load, researchers at the Australian National University in Canberra devised wearable solar panels capable of powering electronic equipment in the field. The flexible, paper-thin cells, aptly dubbed “sliver,” can generate up to 140 watts of power. The best part? You can roll them up for easy storage. Less than the width of a human hair, the sliver cells would dramatically slash the weight on a soldier’s shoulders. Built by Transform Solar in Boise, Idaho, the sliver cells still manage to pull their weight. Although less than the width of an average human hair, the cells have the same efficiency as conventional solar panels. They’re also more rugged, operating at temperatures ranging from -100 to 150 degrees Fahrenheit. Plus, the cells have commercial applications among civilians, as well. “I would see anyone who needs mobile power, that is military and also non-military applications,” says chief investigator Andrew Blakers. “Obviously things like iPods, iPhones, remotes, sensors and the like can make use of this technology,” he adds. The 21st century soldier bears a heavy burden, literally. With 100 to 150 pounds of weaponry, tactical gear, communication devices, and military rations�and that's just for starters�army personnel also have to lug along hefty battery packs to keep their gadgets juiced. 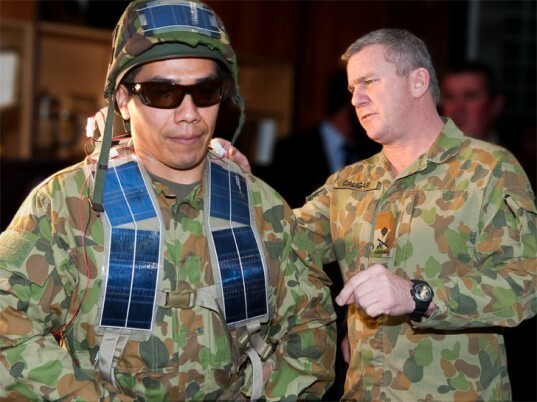 To help lighten the load, researchers at the Australian National University in Canberra devised wearable solar panels capable of powering electronic equipment in the field. The flexible, paper-thin cells, aptly dubbed "sliver," can generate up to 140 watts of power. The best part? You can roll them up for easy storage.